A tubular, elastic, stretch net designed to serve as a secondary dressing. It applies gentle pressure to keep bandages or other medical devices securely in place without adhesive tape. Ideal for securing burn or post-op dressings, hot or cold packs, IV tubes, incontinence pads and decubitus ulcer dressings. Easy to customize. Allows maximum air-flow. Made from a high-quality nylon and rubber mix. 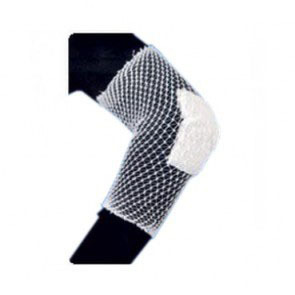 Knitted in a continuous, seamless band and stretches well beyond its relaxed length and diameter, applying gentle pressure to keep bandages securely in place. Skin-contact surface is smooth and non-loopy, offering greater patient comfort.